Half marathon races come in all shapes and sizes, but here we’ve swung the spotlight on the fast ones. The pan-flat course profiles sought out by pb hunters everywhere. Bagging a good half marathon time is something every runner has on their To Do list. Its one of the classic benchmarks to test yourself against. 13.1 miles is long enough to be a true test of fitness, stamina, pacing, form and mental strength, but short enough to be within reach of anyone willing to train consistently for a couple of months. Also appealingly for many, a ‘cheeky half’ doesn’t demand the long weekend training runs of a full marathon. We’ve included a mix of races. They offer a variety of experiences, from the small, locally organised runs like the River Thames Half to the full-on festivals like the Great Scottish Run. This is just a small selection of the best flat half marathons. If none suit, you can search the complete list of hundreds of races all over the UK. Let us know on Twitter or Facebook if you find your next start line amongst the races below. The Oxford Half Marathon has a new route for 2015. The course now takes runners past many of the city’s best-known sites including the Bodleian Library and the Radcliffe Camera. Part of the well publicised Vitality Run Series, it’s likely to hit its limit of 8,000 runners soon. Entry £40. A fast sea-level course starting in Bristol's historic Harbourside and taking in views of the old city, Avon Gorge and Brunel's famous Suspension Bridge. Now in its 27th year, this is a well established event, attracting a quicker than average field. Entry £36. A medium sized (2,000 runners) event with a reputation for good organisation and friendly marshals. As if that wasn’t enough, the goody bag includes perhaps the best cake in the business. The course takes in two laps of a pan flat course on a mix of pavement, cycle paths and the seafront esplanade. If the weather’s kind, this is definitely pb territory. Course record 1:08:00. Entry £18. At the other end of the country, and event scale, is the Great Scottish Run, Scotland’s biggest running event. 15,000 runners will pound the streets, cheered on by bagpipers, drumming bands, and ‘Wall of Sound' zones. Entry £32. If this feels a little overwhelming, another option for Scottish runners is the much smaller, but equally flat Scottish Half Marathon. For many, Peterborough might not be the most familiar of cities - the event website helpfully has a page 'Where's Peterborough?' for the more geographically challenged - but its well worth the trip. A fast, city-centre course, designed with one thing in mind: speed. A slight change has been made this year, making the course even faster. 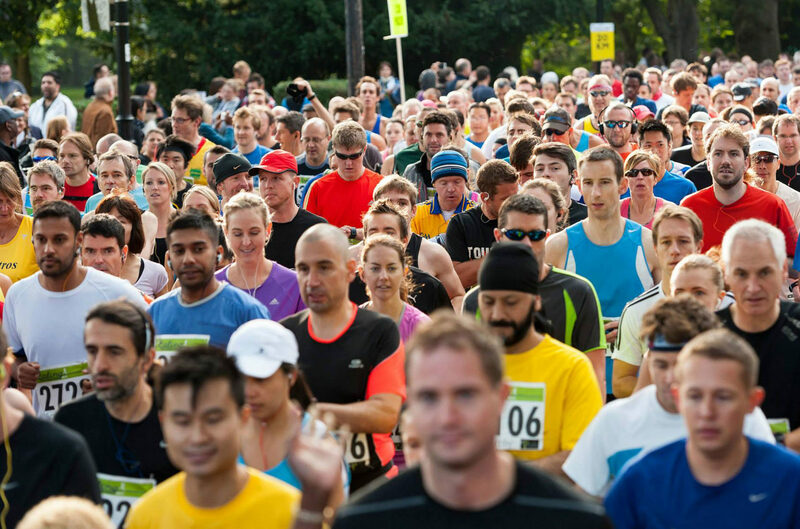 The Great Eastern Run attracts a quick field, which will help speedier runners to find others of a similar pace and work together. Entry £25. (nb. For stat lovers, this article by Simon Freeman looks at the benefits of doing events with similarly paced runners). One of only three fully closed road half marathons in London and voted the UK’s best half marathon at the 2015 Running Awards. Not entirely flat, but what it lacks in pb potential it more than makes up for in atmosphere, with over 20,000 spectators turning out to cheer on the 4,000 runners. Course record 1:07:33. Entry in advance £36.